It's a greek island. That includes lots of cliché things you may imagine. But most importantly it means I can visit my family and catch up with old friends, while having holidays. And all this usually by the sea. The way people talk. Samos people have a very distinct way of pronouncing words. It may sound a bit redneck to big-town people, but it makes me feel home. Even I start talking like this on the second or third day there, even if in real life I sound like an news anchorwoman. And I love it! Small distances. It's a bliss to know that everything is a 10-15 min. walk away. You even get a tan on the way, and it gets even better at night. Painful high heels, breathalyzer tests and weird cab drivers are not an issue here. The worst thing I ever had to do was walk the 5 minutes from the bar back home barefoot. Home. More specifically the garden, my cats and the fact that I can hear the waves breaking on the beach when I go to bed at night. Saying "good morning". Many people hate small towns because everyone knows everybody else and argue that gossip is inevitable. Well, I never had such a problem. I love knowing everyone and the walk from my house to my mum's work in the morning is filled with familiar smiles and heartfelt good mornings. Makes my day! 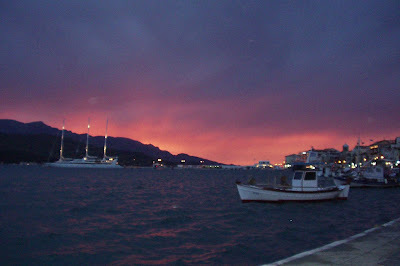 More about Samos island here. Oh! Your home sounds simply wonderful. Awesome. I wondered if I should have done my home state (Illinois) too, but in the end, I feel like MN is my true home. Hope I can come visit you someday - Samos sounds relaxing and welcoming and idyllic. My grandfather emigrated from Samos in the 1910s to the US. He was really young when he came, and really old when he had my dad. Samos is the number one place in the world I've wanted to visit since I was a very little girl. I'm seriously jealous that you've lived there and intend to again. I 've never been to Samos and I'd love to.. I've heard that it's beautiful.. I hope I will make it this summer! Moving there immediately... sounds like a dream! your home sounds amazing. I've always wanted to visit greece. oh and don't worry about the 7 years studying i'm in the same boat with you. Hey! Thanks for your comment back. My last name is Karaianis. My father says when he came through Ellis Island, they left a few letters out of my grandfather's name. But we have no record of what it was (that I've found, anyway). We called him Tom, but his Greek name was something like Athanasius. I'm pretty sure he emigrated in 1916.